Prodigy Surface Tech is a NADCAP certified chemical processor. Customer approval is required for any exception to drawings and/or specifications. Unless otherwise noted, the most current revision level for any ASTM, MIL or AMS specification will apply. Many of these specifications require additional testing not required for commercial work. To comply with certification requirements, our order review and entry procedure will place a hold on orders with discrepant process requirements. We assume all new work with ASTM, MIL or AMS specifications will require NADCAP compliance unless otherwise noted. To prevent orders from being placed on hold, please provide some general guidance by completing the Purchase Order Exemption Form (POEX01). The prices and terms of quotations are not subject to modification or change unless approved in writing by PRODIGY SURFACE TECH INC. Quotes are valid for 30 days. PRODIGY SURFACE TECH INC acknowledges Buyer’s order on the express condition that goods will be sold only on the terms stated herein or in any PRODIGY SURFACE TECH INC quotation previously issued in connection with this order. Such terms will control, if in conflict with terms of Buyer’s purchase order. All orders and contracts are subject to acceptance by PRODIGY SURFACE TECH INC. Quotation errors are subject to correction by PRODIGY SURFACE TECH INC. PO’s without prices or incorrect prices cannot be scheduled for production without prior consent as described in POEX01. Tools, fixtures, gages and their engineering and design are considered an integral part of Sellers’ manufacturing process. NREC’s convey to Buyer the use of tools and other engineering data, but does not convey title, or right or possession. The above items will be maintained by PRODIGY SURFACE TECH INC. However, PRODIGY SURFACE TECH INC shall not be obligated to retain them beyond three year after their last use. Ample allowance must be made for reasonable scrap and material must be of suitable quality to facilitate efficient production. 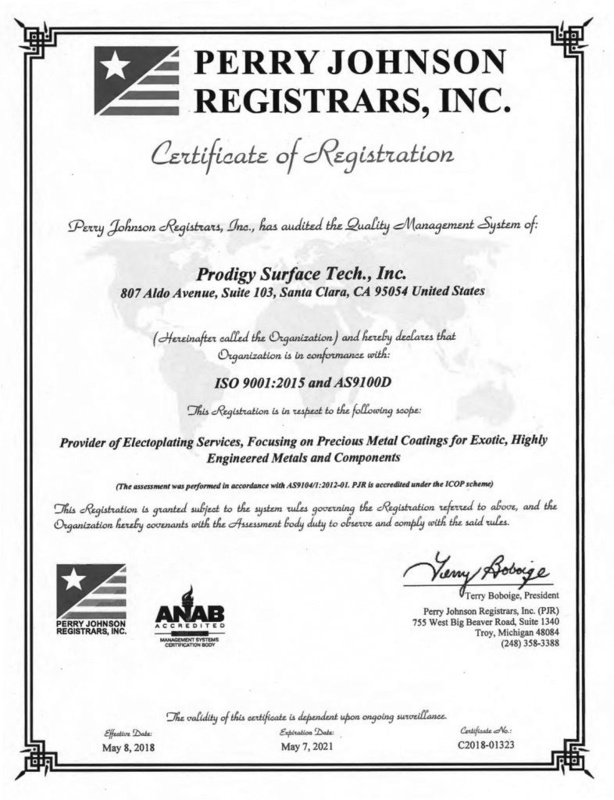 PRODIGY SURFACE TECH INC is not responsible for loss or damage to any materials supplied to PRODIGY SURFACE TECH INC by Buyer, whether such loss or damage occurs in or outside the course of normal manufacturing processes. All products will be cleaned and packaged according to PRODIGY SURFACE TECH INC standards. Special cleaning, packaging and labeling is available at Buyer’s request and will be subject to additional charges. Delivery terms are FOB Santa Clara, CA. In all cases, risk, loss, or damage to goods in transit shall fall to the Buyer, who shall file any resulting claims with the carrier. Payment terms are 30 days with approved credit, unless noted otherwise. Late payments of 60 days past the invoice date may be subject to a 1% per month charge, which will be added to past due accounts, unless other arrangements are made. All orders are subject to management approval and periodic review of credit and payment terms. PRODIGY SURFACE TECH INC may modify credit and payment terms with reasonable notice for good cause. Orders may be cancelled, in writing, only with the consent of PRODIGY SURFACE TECH INC. A Cancellation fee may be charged for all costs incurred, including tooling, engineering, materials and manufacturing. Buyer shall also pay PRODIGY SURFACE TECH INC reasonable costs of processing the termination, such as settlement expense and attorney’s fees, if applicable. PRODIGY SURFACE TECH INC warrants its products to conform to the specifications described in its quotation or its literature, whichever is applicable. PRODIGY SURFACE TECH INC makes no other warranties, express or implied, and hereby specifically negates any implied warranty of merchantability or fitness for a particular purpose. Claims for discrepant parts must be made within 90 days from delivery to Buyer. Goods may not be returned to PRODIGY SURFACE TECH INC without first obtaining a Return Material Authorization (RMA) number. Where it is agreed that parts are defective, PRODIGY SURFACE TECH INC’s liability will be limited to the replacement, repair, or crediting of the Buyer’s account. NO credit will be offered for claims processed more than 12 months after shipment to buyer. PRODIGY SURFACE TECH INC shall not be liable for damages or delays in performance caused in part by third party strikes, accidents, freight embargoes, fire, floods, inability to obtain special materials, conditions arising from government orders or regulations, war, national emergency, acts of God, and any other cause beyond PRODIGY SURFACE TECH INC’s reasonable control. Buyer assumes liability for and indemnifies PRODIGY SURFACE TECH INC against any cost, liability damage, or expense relating to patent or copyright infringement when parts are made to Buyer’s specifications. PRODIGY SURFACE TECH INC’s prices do not include sales, use, excise or similar taxes. Thus, in addition to the price specified herein, any present or future tax applicable to the products sold hereunder, shall be applied to the price and paid by the Buyer. This order shall be governed by, subject to and construed according to the laws of the State of California. A state or federal court located within California will have sole jurisdiction over any litigation concerning orders.